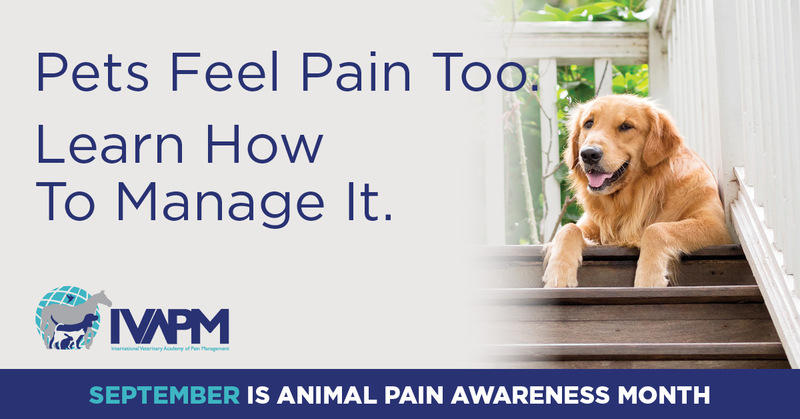 The Mildmay Veterinary Clinic and the International Veterinary Academy of Pain Management (IVAPM) wants to take this time to talk to you about September being Animal Pain Awareness Month. This month coincides with human medicine’s Pain Awareness Month, which is fitting since animals suffer from pain just like us people do. Pain comes in many forms: surgical pain, dental/oral pain, arthritis and cancer-related pain to name a few. Old age is not a disease, but the pain is. There are many options to treat the various causes of pain in animals including pain medications, anti-inflammatories, physical rehabilitation, acupuncture, laser therapy, and therapeutic massage. Many of these forms of pain management are available locally such as medications from your vet, or a physiotherapist that can do sessions in your home. What you should NEVER do to try and aid your animal’s pain is give human medicines, such as acetaminophen or ibuprofen. These medications can cause detrimental effects to your animal’s health and even death. Please ask your veterinarian if you are unsure about any medications before giving them to your pet, and don’t hesitate to give us a call if you think your pet is experiencing pain!